Anyone can predict the future but no one can guarantee it. These projections are based on projecting each team's second-quarter performance over the remainder of the season. If that were to happen -- and it won't -- the Eastern also-rans, in order, will be Carolina, Pittsburgh, Toronto, Atlanta, Ottawa, Tampa Bay and the New York Islanders. Failing to make the playoffs in the West will be, in order, Dallas, Edmonton, Los Angeles, Minnesota, Columbus, Nashville and St. Louis. The second quarter will not be replicated over the second half because such projections don't take into account unforeseen injuries and schedule imbalances. This little exercise didn't take into account remaining home and away games or each team's performance to date for road and home games. But look at what has happened this season. Two teams that are not currently in the playoff picture and project as playoff watchers are the Minnesota Wild and Pittsburgh Penguins. Both have led their respective divisions this season and crashed in recent weeks. Pittsburgh had an 8-13-1 record in the second quarter, a 38.6 percent points-acquisition rate. If they keep it up, they'll finish with 76 points, in 10th place in the East after representing the conference in the Stanley Cup Finals last spring. The Wild led the Northwest Division on Nov. 1, were tied with Vancouver for the lead on Nov. 17 and only one point back on Dec. 10. They now trail the Flames by 11 points, after earning only 45.5 percent of second-quarter points. They project to finish 12th in the West with 80 points. The Canucks had a good run into the second quarter, but earned only half their available points to fall five points back of Calgary. They project to 90 points, tied with Colorado. The best performing teams in the second quarter were the Bruins, 80 percent; the Sharks, 77.7 percent; the Flames, 77.5 percent; the Capitals, 76.2 percent and the Red Wings, 71.4 percent. The worst performing second-quarter teams were the Islanders, 22.3 percent; the Lightning, 35 percent; the Senators, 36.8 percent; the Thrashers, 37 percent and the Blues, 35.7 percent. Flames goalie Miikka Kiprusoff leads the NHL with 39 starts and 25 wins, 10 more starts and four more wins than the Sharks' Evgeni Nabokov. If Kiprusoff stays healthy, he'll likely lead the NHL in starts. While it appears Nabokov could overtake him in victories, the Sharks goalie won 13 of his first 15 starts and only eight of his next 14. The next two goalies, Henrik Lundqvist and Niklas Backstrom, play on teams that project downward. Buffalo's Ryan Miller is next with 18 wins, but the Flames project to win more than Buffalo. Tim Thomas is next in wins but he's part of the goalie tandem in Boston with Manny Fernandez. Rookie Steve Mason leads the NHL at midseason with a 1.82 goals-against average and a .934 save percentage. Mason has been phenomenal but the history of the NHL is replete with flash-in-the-pan rookie goalies whose weaknesses were soon found. Florida's Craig Anderson, Thomas and Fernandez, and Anaheim's Jonas Hiller, another rookie, are pressing Mason and play on teams projected to do better than Columbus, which has suffered several serious injuries after a bright start. 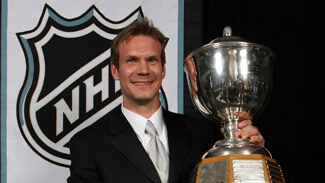 Detroit's Nick Lidstrom and Brian Rafalski will be Norris candidates. San Jose's Todd McLellan makes a strong bid for the Jack Adams. Pavel Datsyuk is strong in both the Selke and Lady Byng races. Mason currently leads for the Calder. Nabokov, Kiprusoff and Fernandez provide stiff challenges for Thomas in the Vezina race. Lady Byng and Selke -- Marc Savard, Boston. Sound crazy? Everyone of those listed Bruins is a leading candidate and if Boston continues its 80 percent points-acquisition pace, and wins both the President's Trophy and the Stanley Cup, the Bruins all have a good chance of winning. Staying power or one-half wonders? The Boston Bruins, Philadelphia Flyers and Washington Capitals topped their divisions in the Eastern Conference at the midpoint of the 2008-09 season and the San Jose Sharks, Detroit Red Wings and Calgary Flames were the best in their Western Conference divisions. Will those trends hold up for the 41-game sprint to the regular-season finish line? Well, if things continue as they did in the second quarter of the season, the six current division leaders will win their divisions. Also, Capitals right winger Alexander Ovechkin, the 2006 Calder Trophy winner as rookie of the year, and last season's Art Ross and Rocket Richard Trophies winner with a league-leading 65 goals and 112 points, will repeat as the goal-scoring and points champion again. In which case, he'll probably also repeat as winner of the Hart and Lester B. Pearson Trophies. Things rarely go according to statistical projections when discussing a game as emotional and physically demanding as hockey, but the first-half numbers -- and, more specifically those from the most recent quarter -- do give us a sample with which to play. Take Ovechkin. He was unsettled by his grandfather's serious illness early in the season. In the first 13 games this season, Ovechkin had 4 goals and 9 assists for 13 points. In his next 26 games, Ovechkin poured in 23 goals and 17 assists. Projecting his pace of those 26 games, Ovechkin will have 61 goals and 52 assists for 113 points when the curtain falls on the 2008-09 season. League leader Evgeni Malkin had 7 goals and 24 assists in his first 20 games and 8 goals and 24 assists in his next 22 games. That means Malkin projects to 29 goals and 95 assists. But his team has struggled into the All-Star Break. Still, there should be a good race between Malkin and Ovechkin for the Art Ross Trophy. Jeff Carter and Thomas Vanek, tied with Ovechkin at 27 goals, project to 54 goals on the season. Malkin's best hope for maintaining his scoring lead may be the healthy return of defenseman Sergei Gonchar, who underwent shoulder surgery Oct. 2 and is projected to return in February. Pittsburgh's power play ranks No. 19 in the NHL; but should improve with the return of Gonchar, a consummate power-play quarterback. But that will not be the only interesting story line as the NHL barrels headlong into 2009. There are interesting playoff races in each conference. In the East, there are 11 teams battling for the eight playoff spots. The three teams on the outside, looking in, are all within 10 points of eighth place. Will Carolina, under new/old coach, Paul Maurice, be able to hold onto its playoff spot and qualify for the postseason for the first time since winning the 2006 Stanley Cup under Peter Laviolette, who was fired to make room for the return of Maurice? Can Florida, which has not made the postseason since 2000, get over the hump this time around after losing captain Olli Jokinen this summer? If the Panthers do, it will be thanks to youngsters like David Booth and Stephen Weiss? It is a similar story in the West. Barring an unexpected swoon, the young and brash Chicago Blackhawks, riding the performances of young centerpieces Pat Kane and Jonathon Toews, are primed to make their first postseason experience since losing in the Western Conference Quarterfinals in 2002. Will they be joined by another team full of youngsters from the Arizona desert? It's possible that The Phoenix Coyotes, under the tutelage of Wayne Gretzky, could finally deliver after years of not-so-near-misses. The Coyotes last made the postseason in 2002, but were right in the mix at the season's halfway point. These new playoff contenders mean that some traditional powers could be on the outside looking in come April. Will the Pittsburgh Penguins, just two wins short of winning the Stanley Cup, miss the postseason party this season, despite the presence of Sidney Crosby and Malkin? What about Ottawa, the Eastern Conference representative in 2007? Amazingly, both could be out if fortunes don't change soon. In the West, Minnesota could unbelievably be the odd-man out after looking so dominant early on. The Wild led the Northwest Division on Nov. 1, were tied with Vancouver for the lead on Nov. 17 and only one point back on Dec. 10. They now trail the Flames by 11 points and sit squarely outside the top eight. But, forget the team battles for a moment, there are some incredible individual moments that promise to play out in the second half. Vancouver goalie Roberto Luongo and New Jersey goalie Martin Brodeur -- conceivably the top-two goalies for Team Canada at next year's Olympic tournament in Vancouver -- have missed almost the entire first half of the season. Each is expected to return in the second half. Will they be the same players upon their return? What about Brendan Shanahan, who missed the first four months of the season before finally signing a deal with the Devils? Does he have anything left? On the opposite end of the spectrum, can young goalie Steve Mason keep up his miracle show in Columbus? In his first season, Mason reached the mid-way point of the campaign leading the League in shutouts, goals-against average and save percentage. Could he be the second coming of Hall of Famer Patrick Roy? What of Zach Parise, the young leading man for the Devils? In his first three seasons, he never scored more than 65 points. Today, he is on pace for a 100-point season. If he accomplishes that feat, he will be the first Devil to reach triple digits in points. The compelling stories even extend beyond the bench. San Jose's Todd McLellan had some serious beginner's luck working for him in San Jose, but he has proven that he is more than a flash in the pan as the Sharks navigated the first half of the season without losing a home game in regulation. Can he continue his golden touch for another three months? Those stories -- and so many more -- will play out during the second half of what has already been a memorable 2008-09 season. So, make sure to tune to see how they turn out come April and the start of the Stanley Cup Playoffs.